The Texas Association of Community Colleges (TACC) has named Dr. Juan E. Mejia as the 2017 recipient of the prestigious Nelson Administrative Leadership Award. Mejia, provost & vice president for academic and student affairs at Tyler Junior College, received the award which was announced at the TACC Conference held recently in San Antonio. TACC includes all 50 public community college districts in Texas and is the backbone organization for advocacy, policy, legislation, and collaboration among the colleges, the legislature, state agencies, and the public. This esteemed award was established in 2003 in memory of Carl M. Nelson, who served as president of Texarkana College and helped many others assume leadership positions across the state of Texas. According to TACC, the honor celebrates the importance of administrative leadership at Texas community colleges by recognizing demonstrated qualities/traits which are generally associated with successful college presidents. Dr. Johnette McKown, president of the TACC Board and president of McLennan Community College, is a former recipient of the Nelson Award. Dr. Mejia began his remarkable higher education journey at Texas State Technical Institute and was instrumental in the transition of the institution to what is now Texas State Technical College. He served as a founding member of South Texas Community College and was instrumental in the transition to what is now South Texas College (STC). In addition, Dr. Mejia taught in a doctoral program for the University of Texas - Pan American. He has served on numerous national, state and local boards, and some of his accomplishments include being recognized by the International Chair Academy and through the 84th Texas Legislature through House Resolution 689, celebrating his work in higher education. He earned his B.S. in Education at Texas A&M University – Corpus Christi and M.Ed. in Adult Education and Ed.D. in Educational Leadership from Texas A&M University – Kingsville. TACC President and CEO Jason Fraire said, "The Association fully recognizes that leadership matters, particularly as we look to the future of community colleges. 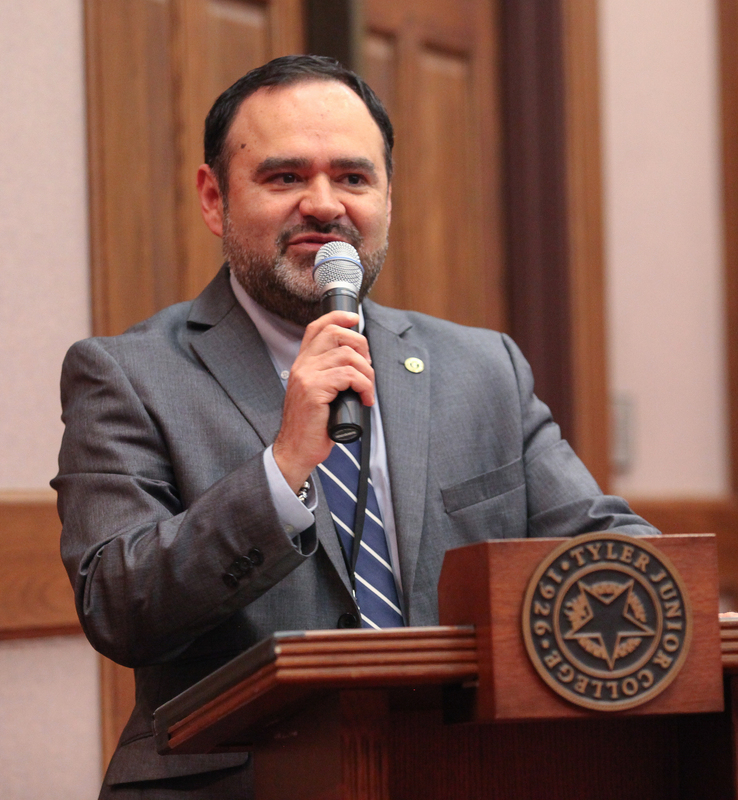 In that spirit we know we have an incredible leader in Dr. Mejia and we look forward to his many contributions to TJC, East Texas, and our great state." “Dr. Mejia has been an essential contributor to the community college mission since 1988,” said Dr. Michael Metke, president of TJC. “Dr. Mejia promotes leadership that includes empowerment, legacy and accountability through ethical behavior, and I have grown to admire his tremendous talent, intelligence, critical thinking and personal traits that make him a fine leader,” he added. Dr. Shirley A. Reed, president of South Texas College, shared, "Dr. Mejia is among the few who I would trust to continue the legacy I have established for South Texas College. Dr. Mejia is a treasure who symbolizes the immense contributions community colleges make toward transforming lives." South Texas College, where Dr. Mejia served as a founding member and Vice President and Chief Academic Officer prior to joining TJC, is the seventh largest community college in the state of Texas, with multiple campuses throughout a large geographic region. STC is the recipient of several Star Awards by the Texas Higher Education Coordinating Board, and was one of the first community colleges to award baccalaureate degrees. South Texas College was the national recipient of the MetLife Award by the American Association of Community Colleges, and the national winner of the Leah Meyer Austin Award from Achieving the Dream. Dr. Mejia called STC home from its inception in 1993 until 2013. "I am very grateful and humbled by the recognition, and I consider this honor a celebration for our entire college community," said Mejia. "I consider TJC a powerhouse institution of higher learning with community support, a great Board of Trustees, a strong administration, faculty and staff who are focused on serving our students and communities, and students who are heroes," he added. "Working with great leaders and mentors like Dr. Michael Metke, president of TJC, Dr. Shirley Reed, president of STC, Dr. William Serrata, president of EPCC and Jacob Fraire, president of TACC, has been an honor." In Texas, 47 percent of all college students are enrolled in community colleges with 11,500 enrolled at TJC each semester. Students in community colleges receive postsecondary credentials necessary for economic development and social mobility. TJC was named one of the nation’s top 150 community colleges in America by the Aspen Institute College Excellence Program.